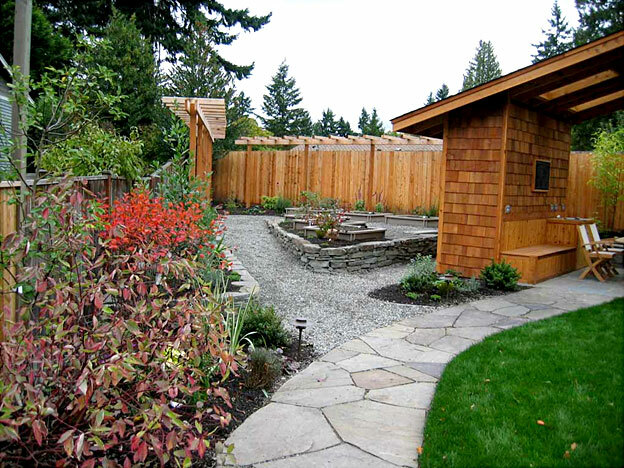 Phil is the owner of Phil Wood Garden Design, providing landscape design for the greater Seattle area, including the eastside and Snohomish County, for over 20 years. His designs create functional and contemporary spaces, influenced by the gardens of other times and places. 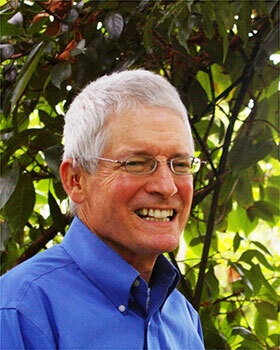 Phil has been active in the Northwest horticultural community for many years as a garden designer and writer. His designs for gardens at the Northwest Flower and Garden Show have received many gold medals. He serves on the board of the Seattle Chinese Garden. Phil earned his Bachelor of Landscape Architecture from the University of Washington and his Bachelor of Fine Arts in Sculpture from Cornish College of the Arts. He takes design inspiration from travels in Great Britain, France, Italy, Spain, China and Japan. 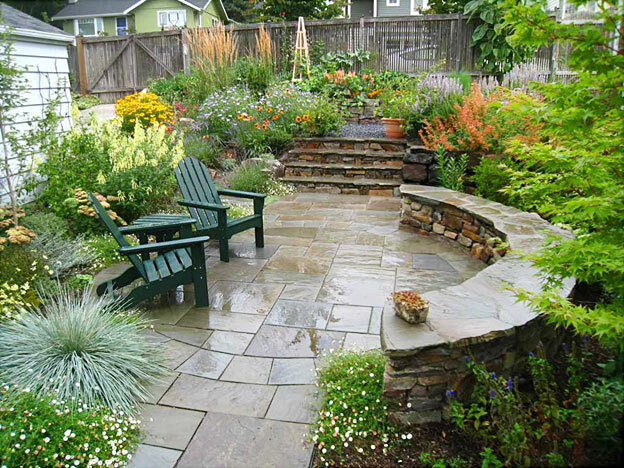 The design of a garden starts with a conversation of the client’s needs and dreams and includes consideration of the unique qualities of the site. Phil works closely with his clients to create a design embracing beauty and livability. The Puget Sound climate rivals any in the world for horticultural wonder and diversity. From this great palette, Phil chooses plants to create a garden splashed with year around color and fragrance. So many plants, so little time! Circular terraces draw together the complex spaces of this garden in north Seattle. 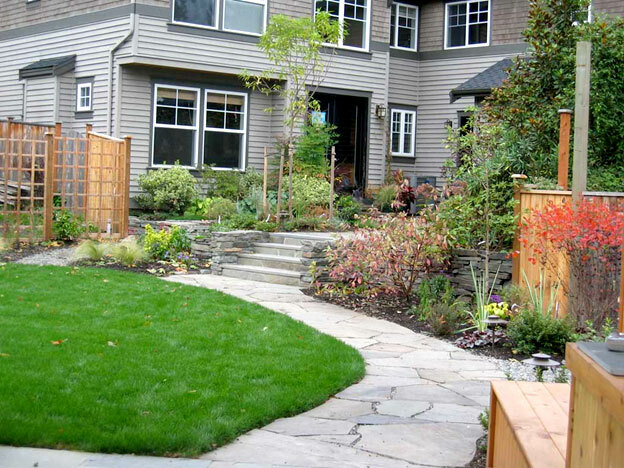 Stone retaining walls make the sloping ground level for outdoor living and dining. 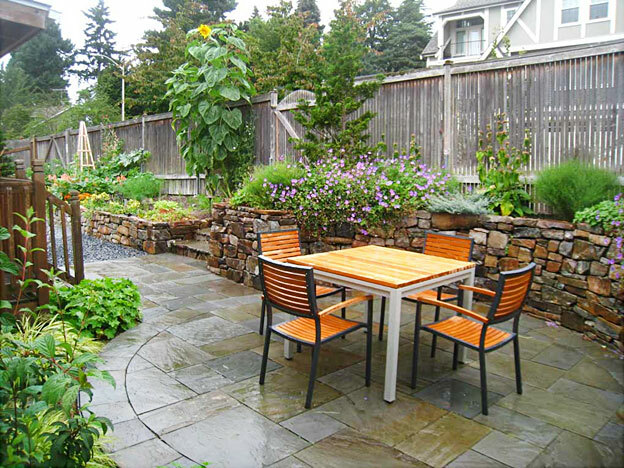 A patio with bluestone paving and benches provide outdoor living. The circular design centers the space. The former slope is tamed with a stone wall and stairs. 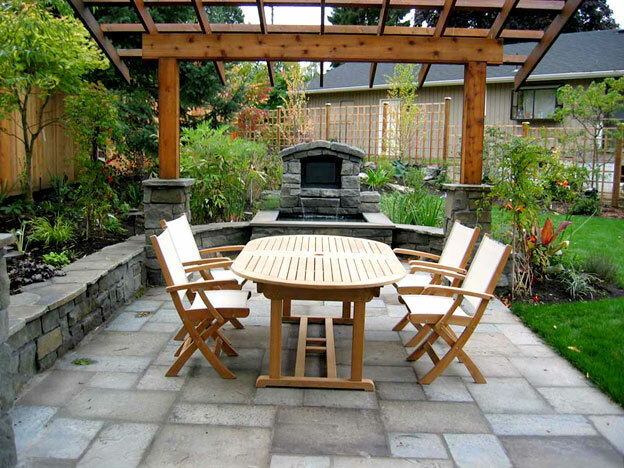 Another stone patio creates an outdoor dining area encircled by planning beds. Flowering plants bring texture and color to the garden. 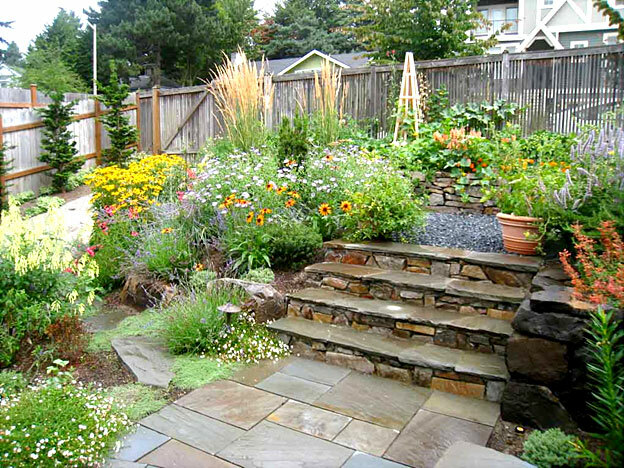 Raised beds with stone walls provide level space for vegetable beds. 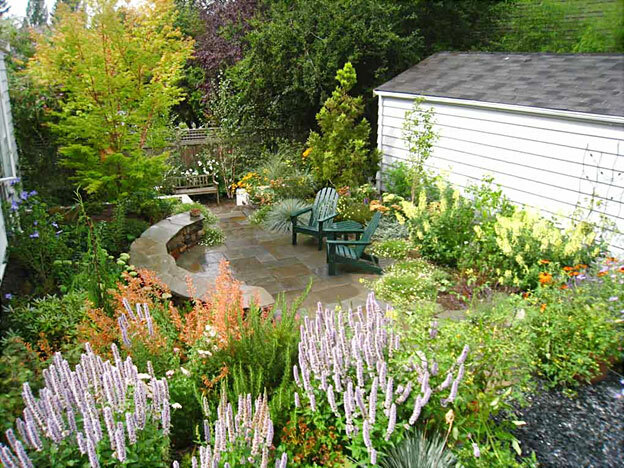 The owners of this Kirkland garden in the west of Market area bought adjacent property to provide a family play and living pace. They requested a lawn for active play for their children, outdoor living and dining, and space for vegetable beds and ornamental plants. 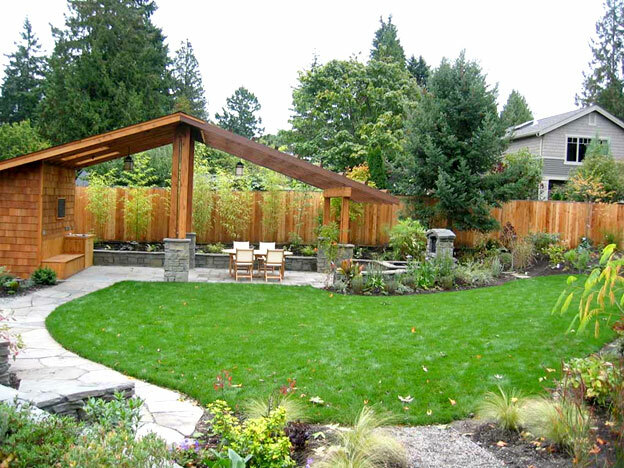 The garden structure provides a covered area on the right for a sitting area and an arbor on the left for outdoor dining. The design takes inspiration from park shelters. The dining table sits under the arbor on bluestone paving. The fountain gives a focal point and features a panel of Northwest native art. New steps and a stone path join the old yard to the new. Raised beds of dry-stack stone provide space for vegetable gardening behind the garden shelter.